For organisations and businesses in 2018, effective employee communication is crucial for sustained competitive advantage. It is the foundation of collaboration, and without effective communication practices organisations are likely to suffer. When communication breaks down, so does the business. If your organisation is identifying rising levels of stress, unmet expectations, relational breakdowns, health concerns, or a smaller bottom line, poor communication could be at the root of the problem. As social creatures it is not difficult for employees to communicate with each other, and yet all too often you hear about agitated team members that have been left out of the loop on an important email chain, or unable to locate saved meeting notes. We cannot expect employees to do their best work if they don’t have access to all the necessary facts. Making enormous sweeping changes to work systems and culture to foster a communicative workplace can seem daunting, but in reality, only subtle changes to management practices and minimal buy in from employees are required. The advancements within the digital age have heralded new ways open communication can be fostered. So, how to foster communication in the workplace? Almost one third of the world’s population is on social media in some way or another. And while sites such as Facebook may have seriously shaken the public’s confidence and trust with the recent Cambridge Analytica scandal, businesses have access to a wealth of encrypted programs designed to foster communication, as well as keep data safe. Instant messaging is an easy to use way to get news to travel fast. By providing a platform for 1-on-1 or p2p communication that employees know how to use, communication between levels and management becomes natural. For those who struggle with face to face or over the phone communication, especially when raising issues, it can relieve the stress from getting that information out to where it needs to go. While overtly social and recreational forms of instant messaging (WhatsApp, Snapchat and others) would be a deterrent, there are a huge number of professional and reliable platforms out there. Microsoft Office, Skype for Business, and many email programs already have built in communication systems that can easily be set up across the organisation. Additional online communication tools such as Slack, Azendoo, and Bitrix24 are extremely customisable and designed with business communication in mind. Social media itself should not be encouraged, however your employees should feel comfortable enough to talk to each other outside of work. Encouraging employee external relationships creates a more positive environment when people are actually excited to come into the office and collaborate. It creates a better corporate culture and improves morale. We communicate better with those we are comfortable with, so providing an environment that harbours friendships can work wonders for your organisation. Did you just successfully tender? Sign a large client? That’s wonderful! But how are you going to inform your employees, if you do at all? Emailing staff important information regarding business movements can ensure employees have access to the information, but there’s no guarantees they won’t be overlooked on a busy day. It’s also an impersonal experience that can make employees feel like spectators in their teams, as opposed to valued resources. When something worth celebrating happens in your organisation, no matter how small, endeavour to tell your employees about it in person. A quick, informal five-minute chat next to everyone’s desks is a far more inclusive and positive way to share news and doesn’t leave employees feeling left out. It brings a sense of humanity to the organisation and doesn’t keep the managers hidden within their offices. While we can’t always meet employees face to face, whether due to agile work practices, working from client sites, or contacting offices in differing cities, try to go for the personal approach whenever possible. Taking control of the informal grapevine in this manner ensures you get the message across as intended. 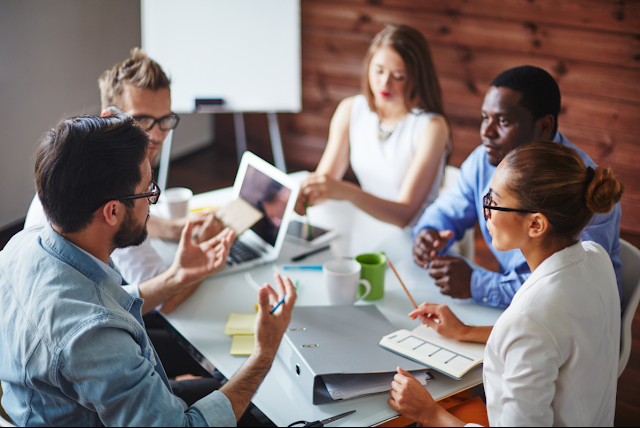 Involving all employees is key, especially in a business where communication is an issue. Employees miss meetings. It’s inconvenient, but it happens in every workplace. What is even more inconvenient, is having said employee running around trying to find out what happened after the fact. Meeting Minutes are an old-fashioned concept that are not utilised as often as they should be. Not just limited to courtrooms and government sittings, documenting important meetings in some form or another is extremely useful and beneficial to every employee, whether they were there or not. For employees that may forget the minute but important meeting details, having somewhere they can easily locate the information is a great help. For those who didn’t understand a concept, or for those that weren’t able to be there, it is again, a very useful tool. Having someone taking notes to distribute after the meeting is a positive and simple way to ensure that everyone is on the same page at the end of the discussion. In addition to minutes, organisations should consider sending out weekly newsletters, or other simple documents recapping the important work and news from the week. Keep all your employees informed and involved by providing such a newsletter, or blogging platform, as in the same way that meeting minutes do, these references give all employees confidence in their position in the business, and where the business is headed. Collaborative communication always beats the top-down approach, and in a society that is in constant technological flux, organisations can not afford to be static. Top-down may have been crucial for organisational development in the past, but organisations have now evolved to a far flatter agile structure. Reflect this approach in communication practices by giving the floor to the up-and-coming employees in discussions where possible. Encouraging an environment with open communication is a must, and employees shouldn’t be nervous or worried about speaking with any other employee, no matter their title. The fear of disapproval and rejection is something that keeps people from speaking or expressing their views, and this stagnant communication will be detrimental in the long term. As much as employees need to be confident with suggestions, their higher ups need to be confident in giving feedback. Explain why the idea would or would not work; explain how they can improve what they have. Employees should not fear the hierarchy, as it should not be something that gets between them and organisational success. Communication and compassion should come hand in hand, as employees are far more likely to feel comfortable and productive in an environment where they feel cared for. Communication should trickle down from compassion, but it’s not always easy to determine how compassionate, or communicative, an employee is before you hire them. For this reason, Psych Press has built a Compassion Scale into our Business Personality Reflections® questionnaire to accurately measure a candidate’s compassion. Ideal employees will be considerate towards other employees and clients, creating a positive flow of interactivity and communication, by expressing interest and sympathy towards those around them. Those who do not possess compassionate traits, however, will not be involved in the affairs of others, and will keep to themselves objectively, potentially damaging employee relations and overall corporate identity. It can be of great benefit when an organisation encourages compassion. Encouraging a healthy amount of chatting at work helps people to feel bonded and positive about work and the workplace, reducing anxiety, encouraging mindfulness, and reducing stress. A happier, healthier employee will take less leave, and will be more passionate about their work, which will ultimately benefit the bottom line. If you are hiring for a job that is associated with high amounts of stress, teamwork, or you just want to improve your communication practices, consider the Compassion Scale in your recruitment process. To learn more about the Compassion Scale, or the Business Personality Reflections® questionnaire, contact us now or simply visit our website.